There have been some wild swings of emotion in the Music City in the past five months. The Nashville Predators looked like a Stanley Cup contender and rolled past the arch-nemesis Detroit Red Wings in the first round of the playoffs. But the Predators ran into the upstart Phoenix Coyotes in the second round, and a late night in Arizona for late-season additions Alexander Radulov and Andrei Kostitsyn didn't help matters. An early exit from the postseason led to a long offseason, when one-half of the team's top defense pairing signed a 13-year contract with the Minnesota Wild and the other a 14-year pact with the Philadelphia Flyers. Fortunately for Nashville, captain Shea Weber was a restricted free agent, so the Predators matched the Flyers' offer sheet and he remains with the organization. Under-valued: Martin Erat - Has led team in scoring each of last two years, averaging 0.8 points per game during that time. Not much talent surrounding him, but solid plus-minus and PP production boosts value. Over-valued: David Legwand - His 53 points were the second-most of his career (63 back in 2006-07) and his 19 PPP were a career-high. He doesn't shoot a lot, doesn't record many PIMs and likely won't duplicate his point production this year. 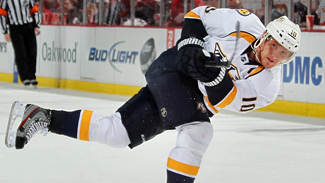 Sleeper: Ryan Ellis - With Ryan Suter out of the picture, expect Ellis to step into the team's top PP unit alongside Shea Weber. At 21, Ellis has all the tools to eventually develop into an elite fantasy d-man. The Predators were a fashionable pick to win the Western Conference in April, but they won't be in September after losing Ryan Suter and Radulov, who returned to Russia. Here's the thing, though -- not many of the other top contenders in the West improved, and the young Predators could be better than a lot of pundits will expect. Don't be surprised if Nashville ends up not only back in the playoffs, but near the top of the Central Division again in 2012-13. NOTES: The top line and Legwand are pretty much set for Nashville, but coach Barry Trotz does not have a problem shifting players up and down the lineup; the Preds' depth and flexibility allows him to do just that. Nashville didn't have any 30-goal scorers last season, but had eight forwards (plus Weber) with at least 14. There isn't a lot of room here, but monitor Austin Watson's progress in camp -- he could be a top-six forward in the near future. Taylor Beck is another player looking to earn a spot, though he will likely end up back with Milwaukee in the American Hockey League at least to start the season. Josi is the obvious candidate to replace Suter next to Weber. Having Gill for an entire season should help, and a step forward from Ellis would go a long way to replacing Suter's production at both ends of the ice. The last spot looks like a battle between Ekholm and Blum, and the loser might not stick around as the seventh d-man -- Nashville would probably rather him play a lot at Milwaukee instead. Rinne now has the highest average annual value (AAV) among all NHL goaltenders, and the Predators are going to need him to be a top-five performer at the position.